Jenson Button has warned that GP2 cars might rival Formula One lap times at some circuits until development of the new-generation F1 cars steps up a gear. At the opening test in Jerez last week, only three Formula One drivers went quicker than the fastest time set at last year's pre-season GP2 test at the same circuit. Although conditions will not have been identical and most F1 teams were focusing on reliability over performance, the fastest time of the week set by Kevin Magnussen was only 0.724s quicker than the quickest GP2 car in 2013 and 4.397s slower than the fastest time at last year's F1 Jerez test. "They [GP2 cars] will be a lot closer on certain circuits," Button said. "At high-speed circuits we will be quicker but not that much quicker, but then again this is the first test with a very new package." New regulations have cut downforce this year and teams are still working hard to get the most from the new V6 turbo engines. 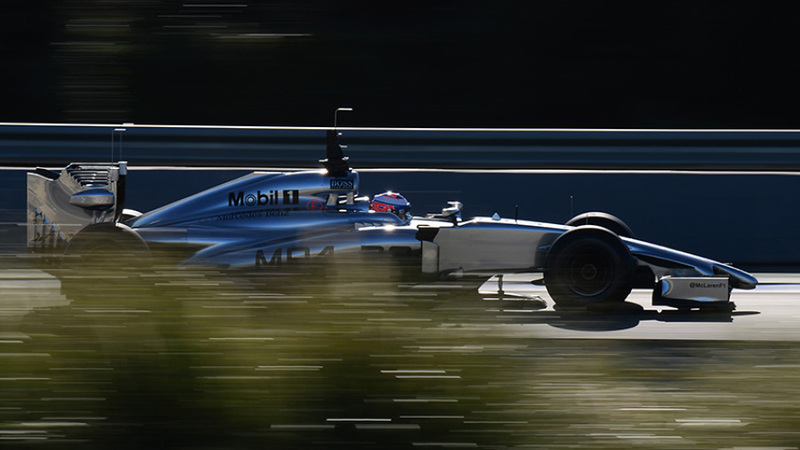 What's more, the cars are heavier and Button said Pirelli's latest tyres are also slower. "The medium tyre we think is half a second slower than last year's medium," he added. "The cars are also heavier, which is about 1.2s slower through weight. So that's 1.6s-1.8s already through those two changes. It was always going to be slower." But Button is confident teams will claw back a lot of the lost lap time as the season progresses. "Last year hardly changed at all in terms of the regulations [from 2012], so at the first test we were always going to be quite quick and then improve for the first race, but not by a massive chunk," he said. "When we get to the first race [this year] everyone will be much quicker and then three races in there will be another chunk of lap time and another second or so. By the end of the year we might not be that far off [2013 lap times] - just a couple of seconds once we get a real handle on it."